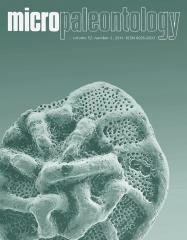 ABSTRACT: We reconstructed Middle Pleistocene surface hydrography in the western South Atlantic based on planktonic foraminiferal assemblages, modern analog technique and Globorotalia truncatulinoides isotopic ratios of core SP1251 (38o29.7Â´S / 53o40.7Â´W / 3400 m water depth). Biostratigraphic analysis suggests that sediments were deposited between 0.3 and 0.12 Ma and therefore correlate to Marine Isotopic Stage 6 or 8. Faunal assemblage-based winter and summer SST estimates suggest that the western South Atlantic at 38oS was 4-6oC colder than at present, within the expected range for a glacial interval. High relative abundances of subantarctic species, particularly the dominance of Neogloboquadrina pachyderma (left), support lower than present SSTs throughout the recorded period. The oxygen isotopic composition of G. truncatulinoides suggests a northward shift of the Brazil-Malvinas Confluence Zone and of the associated mid-latitude frontal system during this Middle Pleistocene cold period, and a stronger than present influence of superficial subantarctic waters and lowering in SSTs at our core site during the recorded Middle Pleistocene glacial. You are not registered as a current subscriber. If your institution has an active subscription, contact us to ask for help with your computer's IP address. If you have an active personal subscription, log in.